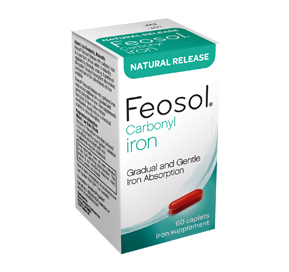 Feosol® Natural Release with carbonyl ironis a pure form of iron which is naturally regulated by the body, making it gentle on the system. Supplements that claim to have a slow release mechanism usually rely on a chemical coating to slow down the absorption. However, Feosol® Natural Release requires no additives or coating for a gradual and gentle absorption of iron. That’s because the type of iron itself is naturally regulated by your body which must produce gastric acid to help with absorption. Gradual Absorption. Low Side Effects. Because of the unique way that carbonyl iron is absorbed by your system, common side effects associated with iron supplements may be minimized, and many people find that it is a well-tolerated, milder alternative to other forms of iron. Gradual, prolonged absorption also makes carbonyl one of the safest forms of iron available – an important consideration for those with children in the home. Lactose, sorbitol, carbonyl iron, hypromellose. Contains 1% or less of the following ingredients: carnauba wax, crospovidone, FD&C blue #2 al lake, FD&C red #40 al lake, FD&C yellow #6 al lake, magnesium stearate, polydextrose, polyethylene glycol, polyethylene glycol 8000 (powder), stearic acid, titanium dioxide, triacetin.